Abstract. Speke's Weaver Ploceus spekei has a limited distribution in Africa (Hall & Moreau 1970). Most of its known records come from eastern Africa where the species is mainly restricted to the highlands (Urban & Brown, 197l). In Kenya, this weaver occurs in the rift valley and in the highlands of central Kenya, within the altitude range 1200-22000 (Britton 1980). Speke's Weavers nest in colonies; they are resident, but wander considerably away from their colonies, especially outside the breeding season. They feed on a variety of foods, such as seeds, insects, and human food. The breeding season is variable but there are definite peaks of breeding activity in the '1ong' rains (March-May) and 'short' rains (November-December) (Brown & Britton 1980). The species has established itself in Nairobi. Gichuki (1983) reported the breeding activity to be well synchronized, thus leading to an apparently high breeding success rate in the city. 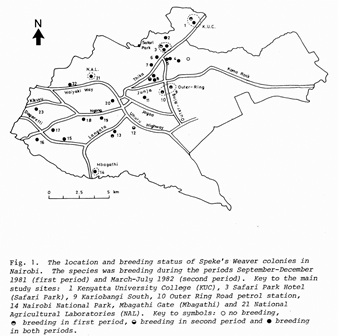 This report describes the sequence of events starting from the initiation of the nests to the post-breeding period of several Speke's Weaver colonies in Nairobi. See a breeding summary of Speke's Weaver here.